The photographs and excerpts are contributed by author Marci Lynn McGuinness from her book, Yesteryear at the Uniontown Speedway. She is presently writing Speedway Kings of SW PA & Region, 100 Years of Racing History, which includes over 100 never before seen or published photographs of Oldfield, the Chevrolet brothers, Milton, Murphy, Laemmle, Firestone and more. She is also shopping her screenplay around based on the story about this wildcat track. From September 1908 issue of Motor Age Magazine a report on a track race at San Antonio. 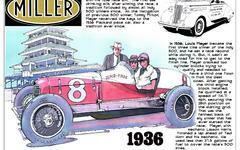 Mentioned is a very interesting figure in early American auto racing, Tobin De Hymel. Not to be confused with the Fairmount Park road race, this is very brief item reporting on a race that occurred at a local horse track near Philadelphia. A driver called "E. Wallace" is credited with breaking a record previously established by Barney Oldfield. It was a fifty mile competition and Wallace drove a Darracq racer. One of the big events in New Orleans during Mardi Gras 1909 was an auto race meet (February 20 - 22) on a mile dirt track near the historic city. Three drivers loomed large during the three days; Ralph DePalma, Bob Burman and the female driving sensation of the day, Joan Cuneo. The Indiana State Fairgrounds 1-mile dirt oval horse track had long ago established itself as the default track racing venue in Indianapolis and the surrounding area. These articles from the Indianapolis Star report on the plans and execution of a motorcycle racing event in the autumn of 1908. An auto racing event had been presented at the Fairgrounds in September. This is a very brief item from the November 8, 1908 Indianapolis Star concerning one of America's top-flight drivers of the day, Lewis Strang. Strang was a busy man. He was preparing for the 1908 American Grand Prize but prior to that he was taking a stab at the world's speed record for 24 hours. The article is poorly written which might be the result of a botched editing job to size it down from a more comprehensive report. Published April 18, 1909 in the Indianapolis Star, this is one of those rare articles (attachment StrangBurman041809) that is very brief, packed with information and holds historical significance. This item was published in the June 18, 1909 Indianapolis Star and reported on a record-setting performance turned in by Ralph DePalma. The Fiat-driving DePalma set a new 25-mile speed record for a one-mile track at Readville, Massachusetts. Attachment DePalma091209 contains two very brief articles about events involving automobiles on dirt horse tracks. These small items were published in the September 12, 1909 Indianapolis Star. The brief article in attachment DePalma101009 was originally published in the October 10, 1909, Indianapolis Star. It concerns the serious accident to champion driver Ralph DePalma and his Fiat Cyclone after a tire burst during a race on the dirt track at Danbury, Connecticut.